He already predicted more than 50 years ago the worldwide raising problems between the increasing human population and the therefore shrinking living space for nature and wildlife all over the world and especially in East Africa. 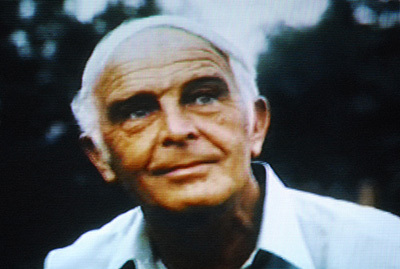 Bernhard Grzimek was one of the first activists for environmental protection worldwide. 25 years ago, on 13 March 1987, the well known veterinarian, ethologist, author and publisher of wildlife-books, film-documentarist and manager director of the Zoo in Frankfurt am Main/Germany, passed away while he was watching the tiger show in a circus performance. His book “Kein Platz für wilde Tiere” (No Room for Wild Animals) and the wildlife-film of the same name came out in 1956. The book was released in many languages and helped to convince governments about the importance of wildlife parks and reservations all over Africa. As the first German film director after the war he won the Academy Award for Documentary Feature in 1959, better known as “Oscar” for his documentary wildlife-film “Serengeti darf nicht sterben” (Serengeti Shall Not Die) which was developed under significant cooperation by his son Michael. For those who experienced their childhood in the Germany of the 1960s and 70s his TV-Show “Ein Platz für Tiere” (A Place for Animals) was a basic part of the TV program. 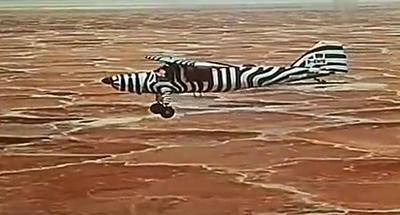 The show was inspired by the U.S.-TV-Show “Zoo Parade”. Beginning in 1956, a total of 175 episodes had been broadcasted until he died. In this show he was sitting behind a desk like a college professor and to each episode he brought an animal from the Frankfurt Zoo which crawled all over him and nibbled at things on the desk. Already in 1945 the zoo was opened again in the destroyed city of Frankfurt right after Grzimek became the manager director. 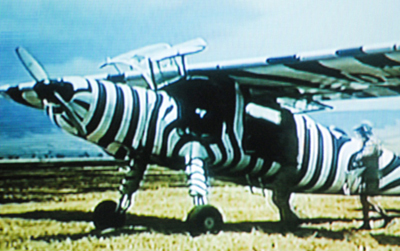 During the war almost all bigger animals had been killed by bombings and for getting new animals he and his son Michael learnt how to fly airplanes and flew to Africa. Here they researched about the animals’ life in their natural environment, their behavior in captivity and which ones were suitable for the zoo. In the following years Bernhard Grzimek and his son Michael spent several month a year in the Serengeti where the oscar awarded movie was filmed. Michael always stayed longer and so he also could do his researches for his work on his doctoral thesis beside the filming. His father only was able to spent about 80 days a year in Africa due to his job as manager director of the Frankfurt zoo. Right after finishing the filming Michael was killed in an air crash while flying his famous zebra-patterned Dornier Do 27 (Code D-ENTE) due to a collision with a Vulture. He was buried on the same day at the Ngorongoro-Crater where the tanzanian government donated the well known stone pyramid as a memorial. After the death of his son Michael, Bernhard Grzimek began to increase his political work for the preservation of nature and wildlife, and especially for endangered species. So he convinced the then-government of Tanzania in the 1960s to abandon the plan of relocating the Maasai with their cattle livestock from the area of the Ngorongoro-Crater of economical reasons and because of the herds of wandering wildlife. This would have caused a fundamental change in the ecosystem with unknown consequences. Even in Germany he made a stir in the 1970s, when he secretly filmed the torturing circumstances in a hen battery and released the film. He also showed how seal hunters killed baby seals with clubs to draw off the fur of the still living animals. This developed in a worldwide scandal about the machinations of the fur industry and let animal rights activists spray paint on rich ladies fur jackets in the public. Actually he was the first idealistic activist who made green politics from the TV screen. Grzimek also was a master in collecting money. All his movies and projects were financed by himself or by donations, for which he asked in his TV show. In Africa he met rich american hunters and convinced their wives of the importance of his mission. Good-looking and eloquent he was very successful in collecting donations. The story goes that, after a long, evening conversation with an American lady in a lodge she added another zero on that cheque over 10.000 Dollars she signed before. With Bernhard Grzimek a man passed away who dedicated his life to the protection of nature, environment and wildlife in an admirable idealistic manner, but also with the necessary pragmatism. 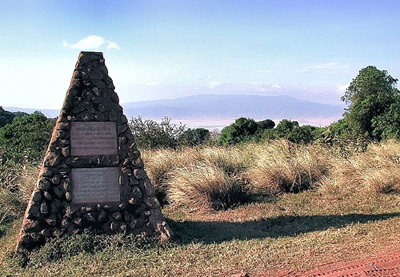 His urn was transferred to Tanzania and was buried beside his son Michael at the Ngorongoro crater. To Michael Grzimek’s honour several schools were named after him in Frankfurt am Main, Berlin and in Nairobi. 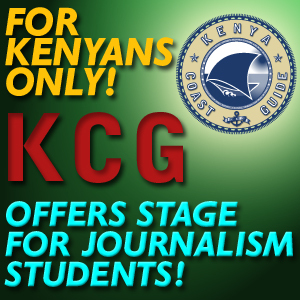 KenyaCoastGuide.com would expressly like to thank Christian Grzimek and the OKAPIA KG for their friendly support.